Epson is a world leader in printing high quality labels from the desktop. However, we Macintosh users have been left out in the cold, as Epson does not provide Macintosh drivers for their label printers. While that may seem unfair to us, there is no need to cry "foul". We as Mac users are not going to let a little thing like 'No support for Macintosh' stop us from getting something done. There are indeed ways for us Mac users to print labels from our trusty Macs! I will cover a couple of those methods below. Some of the setup information below is a bit technical, but you should know that we at Color Label Solutions provide tech support to our customers. If you are interested in purchasing a label printer from us, and a Mac user, we will help you to get your new printer up and running! I have been printing labels from my Mac for over a year now; by controlling remotely a Windows computer using Remote Desktop Protocol (RDP). RDP is supported on Windows Professional operating systems. 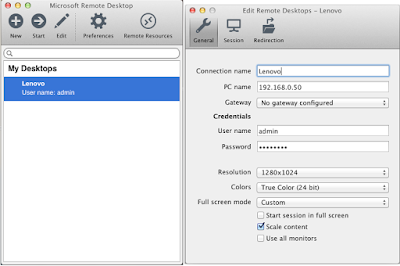 If you have a professional version of Windows running on a PC, it’s fairly easy to set that PC up for remote management on your Mac; by enabling connectivity from the Remote Desktop section of your Windows System Properties. 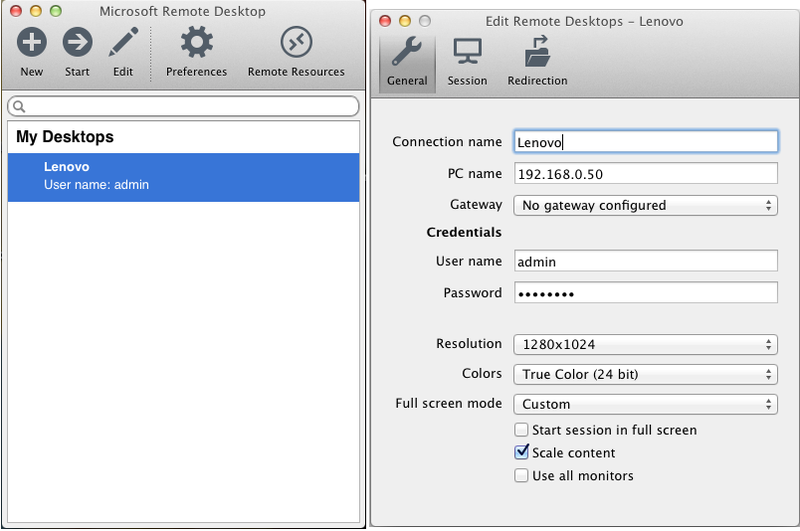 There are several Macintosh applications available that will allow you to connect to a Windows Professional operating system via RDP. I'm using the 'Microsoft Remote Desktop' application created by Microsoft. 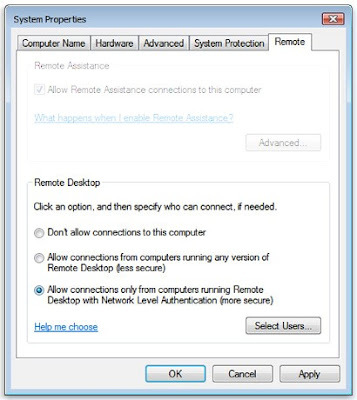 Of course the intended use of RDP is to connect to an actual Windows computer. While that is all well and good if you have a Windows computer, it won't be of much help if you don’t. If you want run Windows a little less expensively, and a little more techie, then in comes the world of the Virtual Machine, otherwise known as VM. VM technology has been around for years, but now it's mainstream. Many companies run their servers virtually, and some companies make a business out of hosting virtual servers for other companies. VM Hosting is big business these days. A data center hosting racks of servers. Each server can support multiple virtual ones; servers that are available to companies via an internet connection. Using that same technology, we can host a virtual Windows operating system right on our own Macintosh desktop! For many years the two options for hosting VM on the Macintosh were Parallels Desktop and VMware Fusion. They are PayWare products each costing around $80. 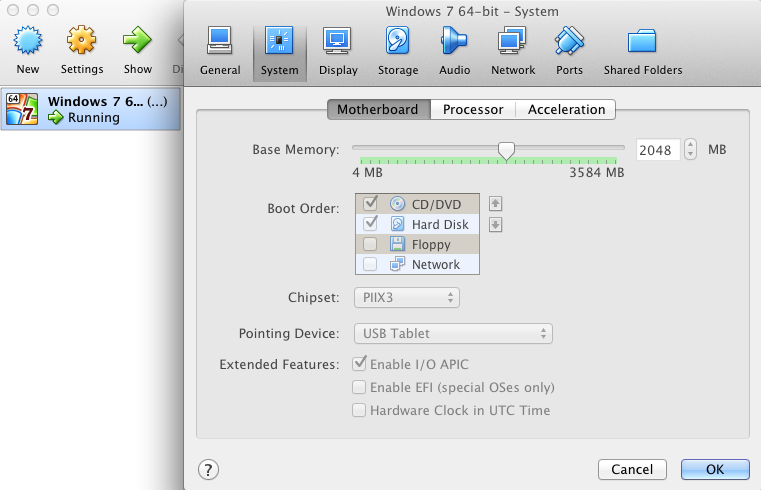 However, now a third option is VirtualBox. 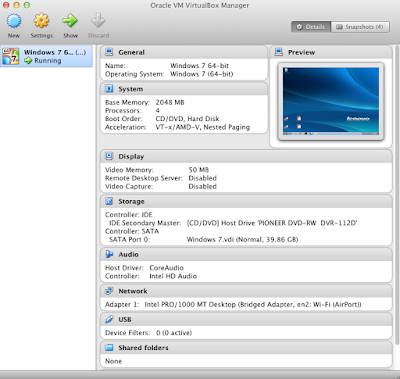 VirtualBox was created by Oracle as an Open Source project; and free! Yes, VirtualBox is free for personal use. 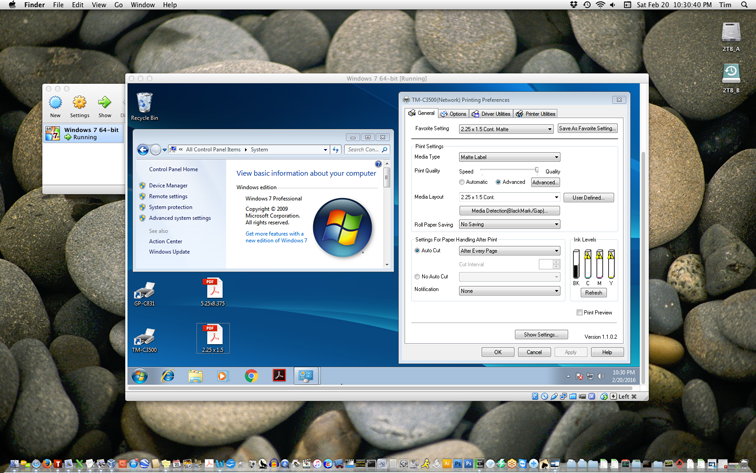 VirtualBox hosting Windows 7 on Macintosh; running the TM-C3500 driver. 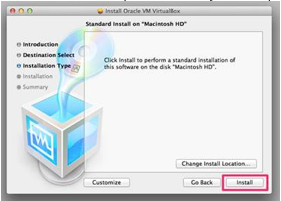 To use VirtualBox, you’ll need to find which version of VirtualBox is compatible with your Mac's operating system. Then you can download and install it. 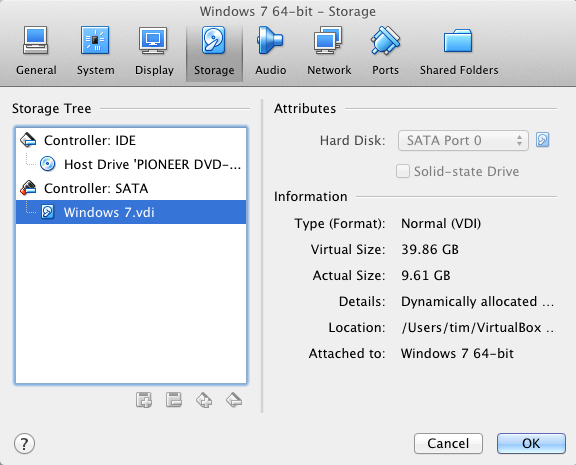 There are several options to consider prior to installing a Windows operating system into VirtualBox on the Mac. What version of Windows do I wish to run on my Mac; 7, 8, or 10? How do I wish to provide network access to the Windows VM operating system; Ethernet or wireless? Do I want to share a folder between the Mac OS and the Windows VM for file exchange? Do I want USB access from the Mac through to my Windows VM? How much of the Mac's RAM memory and the Mac's disk space do I wish to allocate to the Windows VM? Is my workflow going to necessitate bouncing back and forth between the Windows VM and the Macintosh? Hard Drive Storage Allocated to Windows VM. It's Dynamic! Memory allocation and memory availability are both important aspects to consider when setting up your Windows VM. Too little memory allocated to Windows and Windows will run SLOW. Too much memory allocated to Windows and you may starve your Mac OS of memory; making it run SLOW. Therefore, you need to determine the proper balance. Possibly you may even need to purchase additional memory. Generally speaking, you will need to evaluate how you are going to use Windows with your Mac. To determine how best to allocate your Mac's memory, you need to first check to see how much actual physical memory you have. To check how much physical Memory you have in your Mac, pull down your Apple menu and select "About This Mac". For printing labels we need at least some version of Windows to host the printer driver. Each version of Windows will have different memory requirements. In addition to hosting Windows we will also need to have some kind of application program to print label files, such as Adobe Acrobat Reader if the label files are in pdf format. 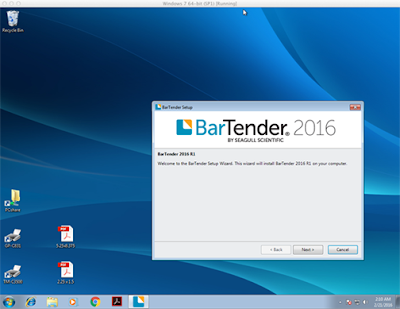 We may also need to consider the memory requirements for Windows-only applications that are needed to create labels, such as Bartender or NiceLabel Pro. So with all of that being considered, we need to decide the allocation of fixed memory to our Windows environment. Installing Bartender 2016 Onto VM. In our label printing scenario, we won't be actively using other Macintosh applications while we are in our Windows VM. Put another way, we won't normally be bouncing back and forth between Windows and the Mac. Consequently, we can allocate a nice chunk of memory to our Windows VM. Once finished within Windows, we can simply quit the Virtual Machine, which will release all of the memory that had been temporally allocated, back to the OS for use with our Macintosh applications. After installing and configuring VirtualBox, you can install Windows. Once Windows has been installed onto VirtualBox on your Mac, you can install the Epson printer driver for your label printer model; and then the Windows applications that you need for your label printing. And don't forget to set up file sharing to allow you to exchange files between your Mac and your Windows VM. 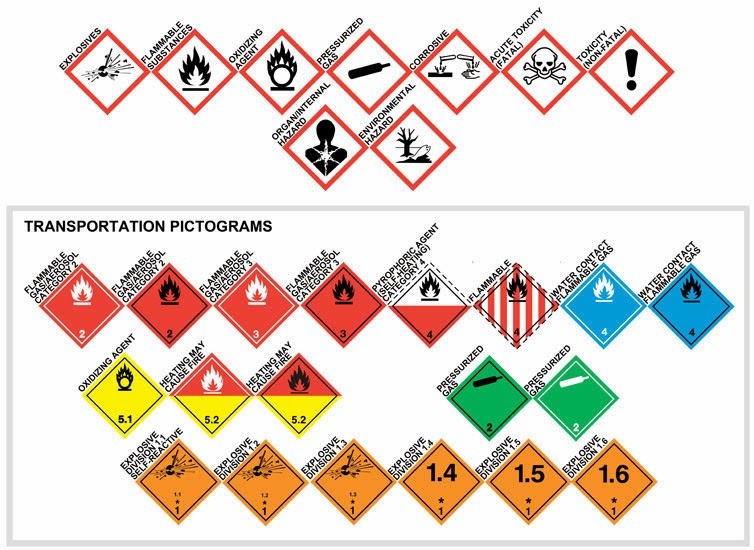 Once you have all of that accomplished, it's "Happy Label Printing from your Mac!" Contact us if we can support your color label printing. The above information does not cover every single setting or system requirement necessary to configure a Windows VM on a Macintosh. It should however provide information to have an understanding of what it takes to host a VirtualBox Windows VM on your Macintosh for the purpose of label printing. Really a Good Post...I Really Like It.......Keep Sharing!! I think its a best post.......Keep Sharing!! Really a good post……Like It!! I like this post……Very Informative……If you want sell your mobile then check oue website. Epson printer roller gets dirty and need proper cleaning and maintenance. If you do not take care of it properly, it will get damage and start coming up with different printing issues. Dial us at Epson Printer Support Number and learn how to increase rollers lifespan.